These signs can be found throughout my neighborhood. Two things. One: why is the dog embarrassed? 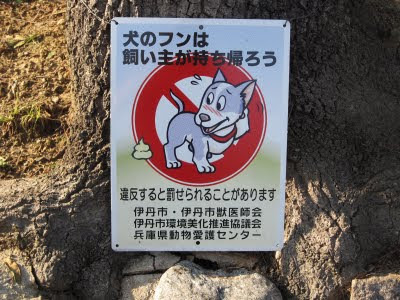 Have you ever seen a dog ashamed to take a crap? Me neither. Two: I can only assume that swirly glob of mayoinaise(without stink lines, I might add) is meant to be doggy doo. Who decided white was a good color for poo? Oh well. To tell you the truth, I'm a little more surprised that the poop isn't smiling. I hope you had as much fun with this one as I did. I enjoyed using multiple words for $*#%. Unfortunately I didn't get a chance to employ turd, dookie, excrement, or ca-ca. Incidentally, the Japanese word for it is くそ(kuso) ふん (fun) or うんこ (unko). Enjoy. Actually I did have a shy dog. He would position himself against a tree & act like he was peeing, with back end covered by the tree. And his ears would go flat. Did not want to be watched. Heh...I stand corrected - I guess some dogs are shy. Jeff - ninja or ninjas? Sushi or sushis? Kimono or Kimonos. But seriously, I want to know what dog scratches at their neck nervously. They have some talented canines over there. At first, I thought it was missing a leg.